What's The Purpose Of The Wooden Wedge For Laminate Installation? 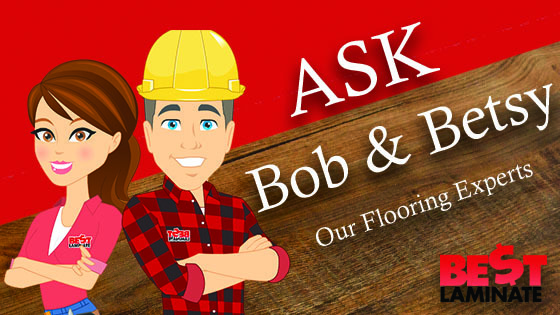 Home >> Ask Bob & Betsy Series >> What’s The Purpose Of The Wooden Wedge For Laminate Installation? I watched a video on how to install a laminate floor and found it to not be very helpful. I wasn’t really clear about the purpose of the wooden wedge that was used to hold the first plank up while the second plank was being connected to the side of the first plank. I am just wondering how the remaining planks are then added on – are planks 1 and 2 held up while #3 is being inserted into 2, and then are planks 1, 2 and 3 held up while #4 is inserted… Do you have more detailed information on installation? We’re sorry to hear that you’re having troubles with an installation video! Sounds like the locking system you’re referencing is the G2 or Angle/Angle type of installation. Don’t feel alone though, this type of installation stumps many customers. However, there is hope! Once you understand how to do it, it’s like riding a bike! What Is The Wedge For? The wedge that is shown in angle/angle installations helps your installation by holding the laminate flooring planks at the correct angle! It’s to guide you into making the installation process easier. You could install the flooring without them, but it might take you longer as you have to get the angle of the boards perfect. The wedge doesn’t come into play until you are installing the second row of your laminate flooring. As you’re installing the second row, you will place the wedge under the first plank and connect it’s long side into the first row’s long side. Once this is locked in, with the wedge still under the first plank, you will lock the short sides of the first and second planks together. You will then push the second plank’s long side down into the long side of the first row. You can then remove the wedge from under the first plank and place it under the second plank. Then continue adding planks and moving the wedge as you go until you finish the row. Continue doing the same thing for each row until you’re done! If you have any questions, refer to the installation diagram that is included in your box. It’s some of the best help you can receive, since it’s directly from the manufacturer. Refer to this video to better help you understand the process. Call us at Bestlaminate and one of our knowledgeable sales representatives can help you! We want to make sure you understand how to install your flooring. Call us at 1-800-520-0961 or contact us on our chat on the website.